Matsya is said to be the first avatar of Vishnu. He is a fish (or sometimes depicted as half man and half fish like a mermaid). He is said to have rescued the first man from a flood in a story that seems to have influenced the Noah flood story (or, perhaps more likely, both stories were influenced by a common source). Matsya is associated with the beginning of the world. Matsya (मत्स्य, Fish) is the avatar of the Vishnu in the form of a fish, preceding Kurma. 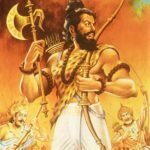 It is listed as the first avatar in the lists of the ten primary avatars of Vishnu. Matsya is described to have rescued the first man, Manu, from a great deluge. 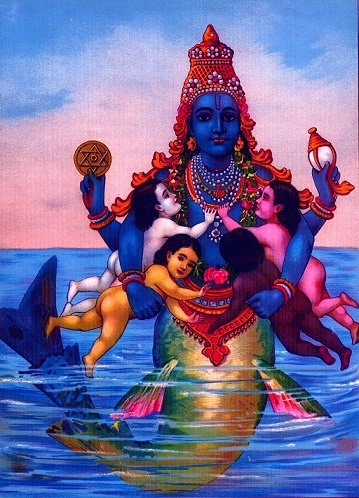 Matsya may be depicted as a giant fish, or anthropomorphically with a human torso connected to the rear half of a fish. One Line Explaination of this avatar is: In this avatar, Vishnu Warn Mahapralaya (Big Flood) and Rescue Vedas. Vishnu also saved the Saint Vaivaswata. This avatar was taken by Maha Vishnu to save the humanity and the sacred Veda text from the flood in the Satiyuga. 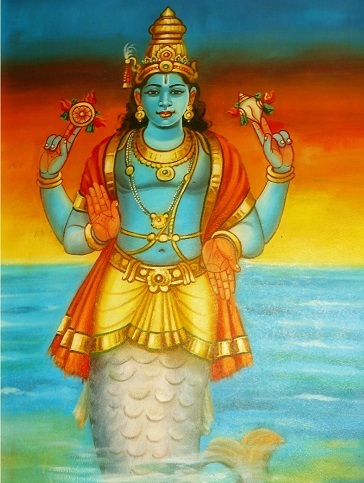 In Matsya Avatar, Lord Vishnu incarnates himself as a fish in this world and informs King Manu that the world would come to an end by a huge flood in seven days and to survive this and move on to the next yug the king to build a huge boat and take the seven sages, seeds of all plants, one animal of each type along with him. The matsya told Manu that he would appear on the seventh day to propel the boat to Mt Himavan. 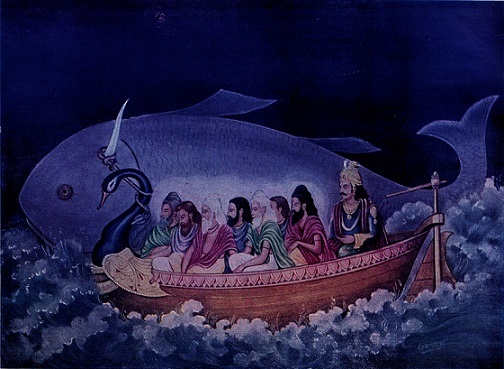 True to his word, lord Vishnu appeared before Manu in his avatar as fish and propelled the Boat to Mt Himavan and kept them there till the flood was over. Many years ago, the whole world was destroyed. The destruction in fact extended to all the three lokas (worlds) of bhuloka, bhuvarloka and svarloka. Bhuloka is the earth, svarloka or svarga is heaven and bhuvarloka is a region between the earth and heaven. All three worlds were flooded with water. Vaivasvata Manu was the son of the sun-god. He had spent ten thousand years in prayers and tapasya (meditation) in the hermitage vadrika. This hermitage was on the banks of the river Kritamala. Unfolding the Story of King Satyavrata and his role in the context of Mahavishnu’s Incarnation as a Giant Fish, Suka Maha Muni informed King Parikshith that the former King would become the Seventh Manu as Sraddhadeva. The incident of the Incarnation of the Lord as Fish was recalled in this context since King Satyavrata was once paying offerings of water in River Kirtimala, a small fish appeared on his palms and requested him not to throw it back in the River as big fishes might swallow it and as such keep it safe in a pot. Manu found an earthen pot in which he could keep the fish. But soon the fish became too big for the pot and Manu had to find a larger vessel in which the fish might be kept. But the fish became too big for this vessel as well and Manu had to transfer the fish to a lake. But the fish grew and grew and became too large for the lake. So, Manu transferred the fish to the ocean. In the ocean, the fish grew until it became gigantic. By now, Manu’s wonder knew no bounds. He said, “Who are you? You must be the Lord Vishnu, I bow down before you. Tell me, why are you tantalising me in the form of a fish?” The fish replied, “I have come to punish the evil and protect the good. Seven days from now, the ocean will flood the entire world and all beings will be destroyed. But since you have saved me, I will save you. When the world is flooded, a boat will arrive here. Take the saptarshis (seven sages) with you and spend the terrible night that will come on that boat. Don’t forget to take the seeds of foodgrains with you. Saying this, the fish disappeared. Everything happened as the fish had promised it would. The ocean became turbulent and Manu climbed into the boat. He tied the boat to the huge horn that the fish had. He prayed to the fish and the fish related the Matsya Purana to him. Eventually, when the water receded, the boat was anchored to the topmost peak of the Himalyas. And living beings were created once again. A danava (demon) named Hayagriva had stolen the sacred texts of the Vedas and the knowledge of the brahman. In his form of a fish, Vishnu also killed Hayagriva and recovered the Vedas. Matsya Jayanti is a day which is celebrated as a birth day of first incarnation of Lord Vishnu on the earth as Matsya Avatar. On that day lord Vishnu had Lord Vishnu born as a one horned fish. He had born as on the 3rd day of Shukla Paksh of the month of Chaitra month according to the Hindu calendar. In the evolution chronology, life evolved in the waters and thus the first form of life is an aquatic animal i.e. the fish (matsya). Proto-Amphibians that primarily lived in water can be seen as the first stage of life. Lord Vishnu took the form of a huge fish and towed the primordial boat carrying good people and cattle to the new world of the future through the waters of the great deluge. As per the theory of evolution, These creatures first appeared some 540 million years ago. A starking resemblance is the first Avatar of Vishnu, Matsya Avatar, which was actually a fish that helped Manu save the world. What a great story! 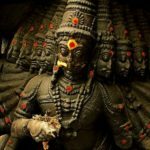 You’ve included more information here than I’ve been able to find elsewhere, and also tied in the story of Matsya savaing the Vedas. Thank you so much! I am curious why in the picture above, the Vedas are represented by babies of different colors. Could you please indulge me by shedding some light on this? This is just a creation of the artist. There is no reason to show the four babies as vedas with 4 different colors. But as we always say, Hinduism is all about representation and interpretations. So this story can also be seen in different way that the four babies represent 4 colors of people in this world and The lord saved all of them. Matsya avatar was NOT the first avatar. Katsya avatar was the first one.